A type of cell formed in the myelopoietic, lymphoid, and reticular portions of the reticuloendothelial system in various parts of the body, and normally present in those sites and in the circulating blood (rarely in other tissues). Under various abnormal conditions the total numbers or proportions, or both, may be characteristically increased, decreased, or unaltered, and leukocytes may be present in other tissues and organs. Leukocytes represent three lines of development from primitive elements: myeloid, lymphoid, and monocytic series. On the basis of features observed with various methods of staining with polychromatic dyes (for example, Wright stain) cells of the myeloid series are frequently termed granular leukocytes, or granulocytes; cells of the lymphoid and monocytic series also have granules in the cytoplasm, but owing to their tiny size and varied properties (frequently not clearly visualized with routine methods), lymphocytes and monocytes are sometimes termed nongranular or agranular leukocytes. Granulocytes are commonly known as polymorphonuclear leukocytes (also polynuclear or multinuclear leukocytes), inasmuch as the mature nucleus is divided into two to five rounded or ovoid lobes that are connected with thin strands or small bands of chromatin; they consist of three distinct types: neutrophils, eosinophils, and basophils, named on the basis of the staining reactions of the cytoplasmic granules. Cells of the lymphocytic series occur as three types, based on the identity of their surface receptors: B lymphocytes, T lymphocytes, and null cells. 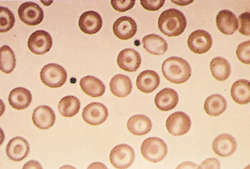 Morphologically, there are two, somewhat arbitrarily designated, normal varieties: small and large lymphocytes; the former represent the ordinary forms and are conspicuously more numerous in the circulating blood and normal lymphoid tissue; the latter may be found in normal circulating blood but are more easily observed in lymphoid tissue. 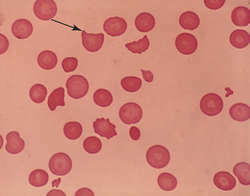 The small lymphocytes have nuclei that are deeply or densely stained (the chromatin is coarse and bulky) and almost fill the cells, with only a slight rim of cytoplasm around the nuclei; the large lymphocytes have nuclei that are approximately the same size as, or only slightly larger than, those of the small forms, but there is a broader, easily visualized band of cytoplasm around the nuclei. Cells of the monocytic series are usually larger than the other leukocytes, and are characterized by a relatively abundant, slightly opaque, pale blue or blue-gray cytoplasm that contains myriad extremely fine reddish-blue granules. Monocyte nuclei are usually indented, reniform, or horseshoe shaped, but are sometimes rounded or ovoid; their nuclei are usually large and centrally placed and, even when eccentrically located, are completely surrounded by at least a small band of cytoplasm. Any of various nucleated blood cells that lack hemoglobin and function in the immune system to protect against agents of infection and foreign matter. White blood cells include neutrophils, eosinophils, basophils, lymphocytes, and monocytes. 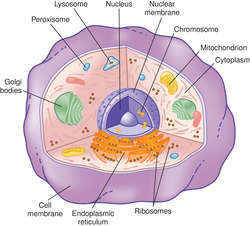 Also called leukocyte, white cell, white corpuscle. A cell in the general circulation that is whitish to the naked eye when centrifuged. Nonspecific immune response cells—e.g., monocytes and granulocytes (neutrophils, basophils and eosinophils)—and specific immune response cells—B and T lymphocytes. Leukocyte Hematology A cell in the general circulation which is whitish to the naked eye when centrifuged Types Nonspecific immune response cells–eg, monocytes and granulocytes–neutrophils, basophils and eosinophils and specific immune response cells, B and T lymphocytes. See Granulocyte, Lymphocyte, Monocyte. A type of cell formed in the myelopoietic, lymphoid, and reticular portions of the reticuloendothelial system in various parts of the body, and normally present in those sites and in the circulating blood. Under various abnormal conditions, the total number of leukocytes may be increased or decreased or their relative proportions altered, and they may appear in other tissues and organs. Leukocytes represent three lines of development from primitive elements: myeloid, lymphoid, and monocytic series. On the basis of features observed with various methods of staining with polychromatic dyes, cells of the myeloid series are frequently termed granular leukocytes, or granulocytes; because the cytoplasmic granules of lymphocytes and monocytes are smaller and frequently not clearly visualized with routine methods, these cells are sometimes termed nongranular or agranular leukocytes. 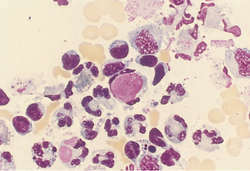 Granulocytes are commonly known as polymorphonuclear leukocytes (also polynuclear or multinuclear leukocytes), because in a mature cell the nucleus is divided into two to five rounded or ovoid lobes that are connected with thin strands or small bands of chromatin; they consist of three distinct types: neutrophils, eosinophils, and basophils, named on the basis of the staining reactions of the cytoplasmic granules. Cells of the lymphocytic series are smaller than other leukocytes and have relatively large, darkly staining, eccentrically placed nuclei. Cells of the monocytic series are usually larger than the other leukocytes and are characterized by a relatively abundant, slightly opaque, pale blue or blue-gray cytoplasm that contains many fine reddish-blue granules. 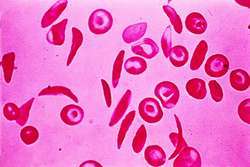 Monocytes are usually indented, reniform, or shaped similarly to a horseshoe, but are sometimes rounded or ovoid; their nuclei are usually large and centrally placed and, even when eccentrically located, are completely surrounded by at least a small band of cytoplasm. Synonym(s): white blood cell, leucocyte. Fig. 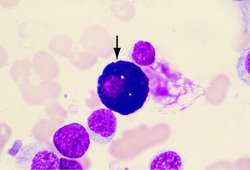 210 Leucocyte . The types and relative frequencies of leucocytes. any of the large unpigmented cells in the blood of vertebrates. There are several types, formed in both lymph glands and bone marrow. Leucocytes are a primary defence against invading organisms and other foreign material, using two main methods: PHAGOCYTOSIS and the IMMUNE RESPONSE. The leucocyte count is usually around 10 000 cells per mm3 of blood. This, however, is not the total body count, because leucocytes are found as much in tissues such as thymus, spleen and kidney as in blood. The cells generally have a short life span (2 to 14 days) although the antibody-producing types (B-CELLS) tend to last up to 100 days. Compare ERYTHROCYTE. See also individual entries for the cells in Fig. 210. A class of cells in the blood that form the foundation of the body's immune system. Cell formed in myelopoietic, lymphoid, and reticular portions of the reticuloendothelial system in various parts of the body, and normally present in those sites and in the circulating blood. n See leukocyte and white blood cell count. Rejection isn't a problem with this procedure since all cells came from the patient's but modified to resist HIV compared to regular immune cells. Disruption in TGF-beta signalling does not simply nudge immune cells to misbehave but appears to singlehandedly unlock the very chain reaction that eventually leads to allergic disease," senior investigator Harry "Hal" Dietz, M.
Through this collaboration, Medinet aims to establish immune cell therapy as evidence-based medicine (EBM) and put it into practical use. The harmful immune cells were unable to gain access to the brain tissue, and the mice that received the highest dosage were protected from disease," said Robyn Klein. However, when they pre-treated the immune cells with clofazimine, the calcium rush was much less and it didn't hang around as long. The predictions could be made solely based on the immune cells, regardless of whether a lymph node contained tumor cells. Bright dots scurry over the grid, representing immune cells called macrophages and T cells. The researchers have come across a chemical called eotaxin that helps immune cells locate the site of infection and blocks basic "fighter" cells from transforming into "seeker" dendritic cells, resulting in a heightened allergic response. These data suggests that the Ceplene/IL-2 combination induces significant and measurable changes in the number and function of key immune cells and further supports the hypothesis that Ceplene protects T cells and NK cells from down-regulation due to oxidative stress," said Kurt R.
And other scientists are now using exosomes given off by immune cells to battle cancer and infectious microbes. Brookfield, Wisconsin for it's Immune Cell Function Assay into selected HLA laboratories in the U.
ISLAMABAD -- Sleeping immune cells which are already in tumours can be 'woken up' to fight even the most deadly cancers, scientists have discovered.